Step up your presentation with modern visuals from 3 Step Creative Circular Diagram for PowerPoint. 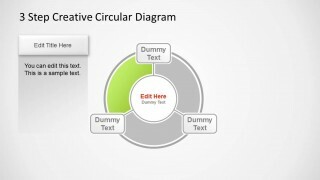 Featuring a segmented, circular and flexible design, this template is for generic use. Personalize your report through this top grade layout. 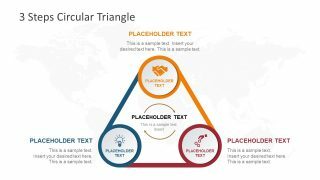 Any topic that includes 3 parts is ideal for this particular PowerPoint template. The applicable concepts can vary from business, organization, academic to legal. 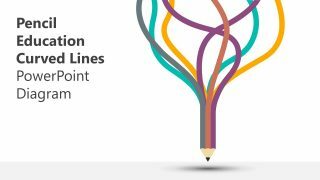 With its fully customisable colors and shapes, the user can suit its look to a specific discussion. Background colors can be altered as well to suit a scheme. The professional mood can surely hook all kinds of audiences. 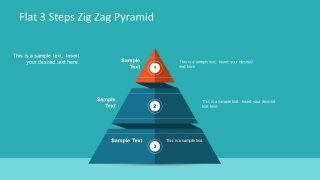 The template contains 5 creative slides. Each slide serves a particular role in the overall presentation. If the user has decided for a certain report subject, the first slide can showcase an overview. It is perfect as an acting background while introductions are done. The circle is illustrated with 3 segments represented by the 3 colored arcs. Individual placeholders are located at every arc where simple titles can be written. 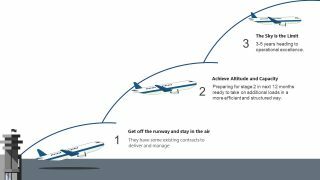 The second to fourth slides are venues for more detailed explanation by the presenter. 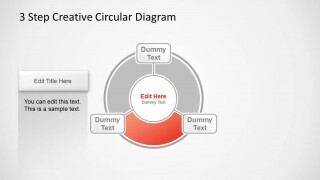 The user can designate one slide for one part of the whole lecture. The last slide can then serve as finale. 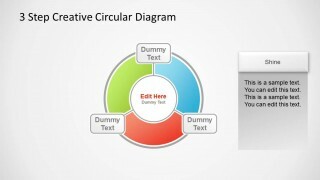 3 Step Creative Circular Diagram for PowerPoint can even supplement a larger presentation to highlight on a single point. A generic template like this is the best choice for a user that is looking at the possibility of multiple applications. It has designs that can be modified and adjusted easily. It is dynamic in showing how the parts influence the whole. Without one arc or segment, the shape will not be a circle and thus, the body is shown as incomplete. 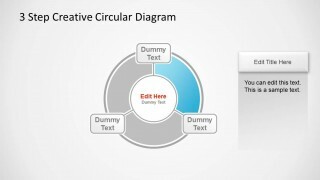 6 Steps Circular PowerPoint Diagram Pentagon Center is another downloadable striking template from the SlideModel gallery. 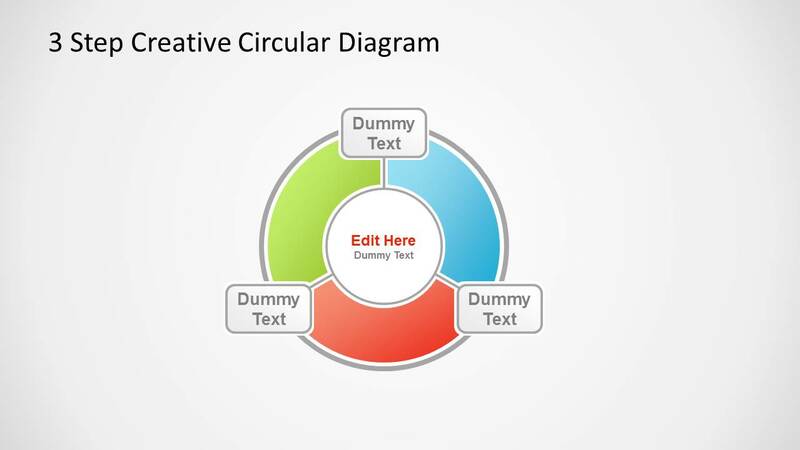 Create a powerful presentation through 3 Step Creative Circular Diagram for PowerPoint now.